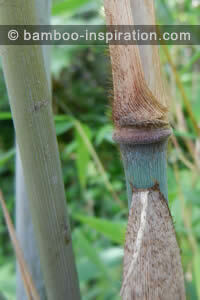 Borinda papyrifera bamboo is a stunning plant and a relatively new introduction to many collections. These bamboos can be hard to obtain, still quite rare, and expensive in relation to other more common bamboo species, but well worth the extra money if you are looking for something to really stand out in your garden. The larger specimens can stretch your budget as they are sometimes almost twice the price. However, this is not surprising when you consider that they are collected from China, then they make their way into specialist bamboo nurseries, followed by years of testing for climate tolerance and hardiness, then divided to provide the end customer with a hardy plant. The work that goes into collecting and bringing on new species is incredible so initially they would have to be a high price. I suppose over the years when they become more common and plentiful the price may come down a bit. My recommendation is that they are worth paying that bit extra for, particularly being still quite rare and it’s an unusual specimen that will really stand out in your landscaping. Single specimen plant or several spaced out to provide beautiful hedge type screening. Planted out against a dark background will really show off the icy blue bamboo culms along with the brown sheaths that seem to open out and/or cling to the culm in different weather before finally dropping. The leaves are a shade of grey green, medium size, and tend to hang down. Foliage thickness increases year on year as the plant matures. 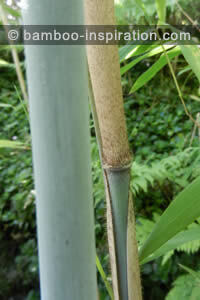 Although as with most bamboo Borinda papyrifera will do best planted out in the ground it can be grown in a large container. If keeping contained, give the plant more care than if in the ground, make sure it gets nutrients and does not get pot bound. Tested in the UK to a minimum of -10C (14F). I have one in a pot that survived a winter temperature of -15C (although the temperature was only that low for a short period of time). Originating at high altitudes means it is for cool temperate regions and is unlikely to tolerate hot climates. If your Borinda papyrifera loses its leaves in the winter you should not be too concerned because they do tend to do that and will usually regain strength in the spring to make a full recovery during the summer. 4.5m - 6m (13-20ft) is average for the height although they could make up to 8m (26ft) in optimal conditions. Canes are thick and can make between 2 and 3cm on average, approx. 1 inch. Borinda has a clumping habit, a non-invasive species spreading over ten years to between 80 to 1.5 metres (2.6 to 5 feet). Sometimes found listed under Fargesia as there appears to be a bit of confusion about it. 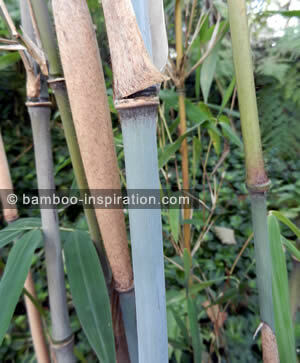 I have seen it listed as Fargesia papyrifera, Fargesia Blue Panda or just Blue Panda bamboo. Borinda albocera - Also has pale blue canes when young that mature to a yellow colour.